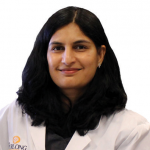 Dr. Mona Sane is a board-certified ophthalmologist specializing in Cornea and Refractive Surgery including Cataract Surgery, Laser-Assisted Cataract surgery, keratoconus treatment, anterior segment diseases, corneal transplants and pterygium surgery. Dr. Sane graduated among the top three students in her medical school, Nagpur University in India. She completed her residency in ophthalmology at Aravind Eye Institute, one of the busiest and largest eye care hospitals in the world. Upon coming to the U.S., she completed a second residency in ophthalmology at State University of New York, Buffalo where she was selected to be the chief resident. She completed a fellowship in Cornea and Refractive surgery at the University of Pittsburgh before moving to the Bay Area. Dr. Sane is committed to providing excellent patient care and customizing treatments to meet the needs and lifestyles of her patients. She is excited to be working with Dr. Furlong and his dedicated team at Furlong Vision Correction to offer her expertise and provide exceptional patient care.